Unionist MP 1892-1918 and elected Unionist leader in 1910. He was a key figure in the anti Home Rule movement. Carson was a strong supporter of the Union but also a supporter of liberal causes. For example he supported demands for a Catholic University. He was a charismatic speaker and made tours around Ulster rallying people to the Unionist cause. Under his leadership opposition to Home Rule became powerful and well organised. When Carson visited Ballymena on the 26th September 1911 he was handed a document signed by local Orange figures proclaiming the devotion of Ballymena to the unionist cause. He made a short speech in which he declared "Ulstermen have never yet failed and never will fail". He went on to say that he would lead them in this "death struggle against Home Rule". Carson visited Ballymena again in July 1913 as part of a speaking tour round Ulster. 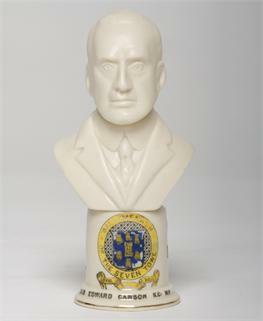 Why do you think this bust of Carson was made?